Wii Play is an unusual entry in Nintendo’s extensive catalogue of classic games. It was designed with two purposes in mind. Most games want to be entertaining, and Wii Play certainly succeeds in this area. However, it was also created to demonstrate the capabilities of the new Wii Remote to players new and old. It draws on all of the features of the motion sensing technology to show players exactly what the console can do through nine diverse mini-games. The game provides great value for players who require an extra Wii remote as it comes packaged with an extra controller. Every game is designed with two players in mind, allowing them to instantly make used of the second Wii remote. Solo players can of course enjoy the game too, with computer controlled allies on hand where required. The most popular games in the bundle will no doubt prove to be the sports games. Players can enjoy Laser Hockey, Fishing, Billiards or Table Tennis, with each being intuitively controlled by realistic motions. Other games include the strategic Tanks, frantic Charge and Find Mii, where players must pick a face out of a crowd before their opponent. 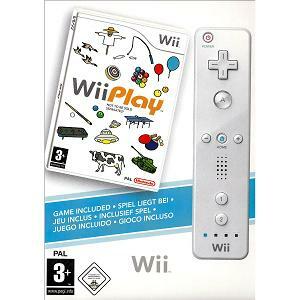 Wii Play is a great introductory game for the Wii, allowing players to get used to controlling games with the Wii remote. It also provides hours of fun for either one or two players with dramatically different games on offer.